I jumped up from my desk and made my way out of the classroom and down the corridor to the make-shift fitting rooms. It was February 1997 in St. Attracta’s National School in Ballaghaderreen, Co. Roscommon. And it was time for my fitting for the school band uniform. I was 11 years old. 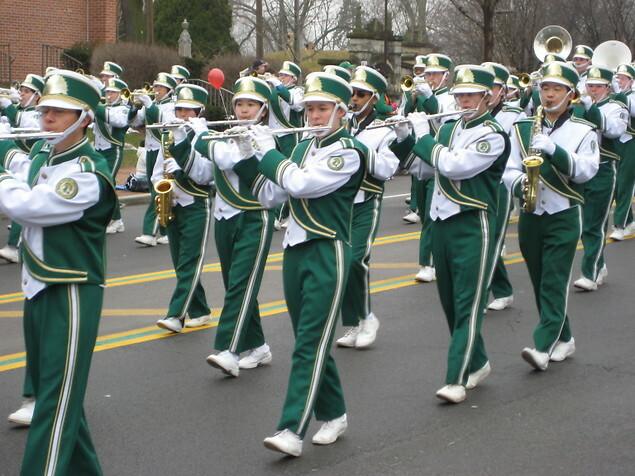 I was a member of the school band and we were preparing for our biggest annual event, leading the St. Patrick’s Day parade in the town’s annual celebrations. Eileen McDermott greeted me as I entered the room, with an array of royal blue uniforms all laid out on the table in front of me. I shuffled while she helped me try on several different uniforms as she attempted to find the best fit. The mustard and royal blue colors had been passed down through the decades, and due to this fact, getting fitted for your uniform was not a precise procedure. There was no tailoring involved, no measuring. The process involved trying on several different blazers and skirts until you found the best fit. In less than five minutes my new uniform was selected and Eileen asked me to send in the next class mate for their fitting. As a band member we would practice for hours and days in the lead up to St. Patrick’s Day. It was an honor to be a part of the school band. Uniform checks, line checks, spacing checks, flag bearers in position, tin whistles poised, drumsticks raised. It was time -- the 17th of March had arrived. We stood in the cathedral car park, itching to begin our stride. It’s more than a decade later when I find myself standing in an Irish bar on 39th Street and Madison Avenue in New York City taking multiple orders for corned beef and cabbage on St. Patrick’s Day 2010. I had lived in the Big Apple for six months at this stage, and I was eager to celebrate my first 17th of March stateside. But running around like a maniac while I tried to cover my section waitressing was not what I had in mind! The pub was wedged. Every stool at the bar had been removed to make room for the revelers. The other waitresses had warned me about “the busiest day of the year,” but nothing had prepared me for this. The menu was cut down to a festive A4 sheet of green paper. It was glasses out as plastic pints came in. This was fast food brought to another level. This was fast Irish food. The entire place was a sea of green as several of my customers complimented me on my acting skills in delivering such as good Irish accent. Through a fake smile and gritted teeth I reassured them my heritage was genuine and that they should hand over their “100% Irish” t-shirt because, frankly, I was the authentic one. Guinness, Jameson and Irish car-bomb shots left most customers in the bar trashed as they tucked into traditional Irish food throughout the day. Countless covers of corned beef and cabbage, and limitless shepherd’s pies rolled out of the kitchen. The waves of busy-ness came and went throughout a day which seemed to last forever. There is a certain exhaustion you get from waiting tables that zaps all your energy and leaves you lifeless at the end of a busy shift. When you sit down to count your earnings for your day’s graft, your legs suddenly give way beneath you as you collapse onto the chair. But it’s a gratifying tiredness, one your body has earned. Finally at the end of our busy day, after pulling a 12-13 hour shift I began to reflect on my St. Patrick’s Day, the U.S. unedited version. Merriment, devilment, excess, tacky t-shirts, and drunks -- and that was just inside the bar. There was an entire different St. Patrick’s Day outside the four walls of that busy pub that I had neglected to see. Perhaps not a true representation, but this was the snapshot that I had experienced. It suddenly occurred to me to that so many others I had served that day had missed out on the true spirit. Waiting for their Guinness to settle, they had missed out on the parade as it passed by. Stuck in a corner of an Irish bar, in midtown eating potatoes and downing pints of beer -- was this really someone’s idea of a St. Patrick’s Day experience? In Ireland, there is no denying alcohol plays a part in the celebrations. But the community spirit and pride of being a part of something/somewhere supersedes the longing to get drunk. We are a proud, defiant race of people who have survived famine, exile and civil war. Surely our national holiday should represent more than over-indulgence in alcohol! This coming Thursday St. Attracta’s National School band in Roscommon will lead the parade through Ballaghaderreen, as they do every year. Immaculately turned out in the same uniforms that have been passed down through the generations, the band members and the onlookers won’t be thinking about corned beef or Guinness. They will be thinking about standing tall on their national holiday, their community and a sense of solidarity that makes us all Irish, not just on the 17th of March but every day.